Dr.Yashwant Singh Parmar (4 August 1906 – 2 May 1981) was an Indian politician. He was a leader of the Indian National Congress and the first Chief Minister of Himachal Pradesh state. He was also the founder of the state Himachal Pradesh. He was born at Chanhalag village near Bagthan in the erstwhile princely state of Sirmour. He studied in the Christian College in Lahore and later received his Ph.D. from Lucknow University in 1944. Upon the formation of the constituent assembly of India in 1946, he represented Himachal Pradesh in the constituent assembly. 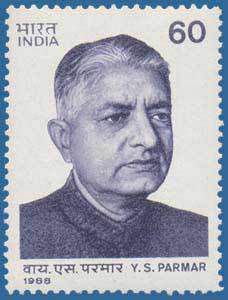 Chief Minister of Himachal Pradesh : He was the Chief minister of the state from 8 March 1952 to 31 October 1956. On 1 November 1956 Parmar had to step down as Himachal Pradesh became a Union Territory and was placed under an administrator designated as Lt. Governor. He again became the Chief Minister of Himachal Pradesh on 1 July 1963 and he was in office till 28 January 1977. Family : Dr. Yashwant Singh Parmar had three sons. Luv Parmar, Kush Parmar and Jitendra Singh Parmar, who got married to Pam Parmar and had two children, Shiva Parmar and Himani parmar. Honours : Dr. Yashwant Singh Parmar University of Horticulture and Forestry, established in 1985 in Solan is named after him. Criticism : Yashwant Singh Parmar got stiff opposition from his own party men. Leaders like the then Pradesh Congress President Kunj Behari Lal Butail, who belonged to Kangra alleged discrimination against the merged areas of Himachal Pradesh.